If you haven’t personally suffered from Plantar Fasciitis, then chances are good you know someone who has. Plantar Fasciitis is a common cause of heel pain that stems from a strain of the plantar fascia, the ligament that supports the arch of your foot. Athletes especially tend to suffer from Plantar Fasciitis as they tend to strain this area of the body through their training. High arches, running for long periods of time and worn out running shoes all attribute to this issue. Although sometimes it can’t be avoided, especially for long distance runners, there are ways to combat it. One of the biggest mistakes people make when they are training is not replacing their running shoes often enough. Shoes tend to break down internally before you ever see any wear and tear on the outside of the shoe. People mistakenly believe that their shoes are still offering plenty of support since there aren’t many visible cues it’s time to replace them. 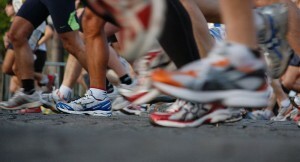 According to www.therunnersguide.com, you should change your shoes every 300-500 miles or every six months. Unfortunately, there is no quick fix for Plantar Fasciitis. Many podiatrists recommend soaking your feet in an ice bath and stretching to increase flexibility. For very extreme cases, surgery may be an option, but really should only be used as a last resort.